While the United States only recently opened its relations with Cuba, UT has had a long relationship with the country and is becoming more involved with the rekindling of diplomatic relations between the two countries. UT, along with USF, will be hosting a conference on José Martí at the USF campus on April 15 and at UT on April 16. The conference, taking advantage of the newly relaxed restrictions, will include 22 renowned Martí scholars from Cuba, the United States and Mexico. It will focus on the recent changes in diplomatic relations between the two countries, and on the importance of Tampa in the Cuban revolution. The university also offers government and world affairs travel courses to Cuba led by Lopez and Associate Professor of Political Science Denis Rey. The baseball team traveled to Cuba in January 2014 for a cultural exchange program and to play a few teams. Last October, College of Business led a trip of administrators there as part of its Global Access Partnership (GAP) program, organized by Dr. Hemant Rustogi. Tampa is has important ties with Cuba, too, as it was one of the birthplaces of the Cuban revolution. José Marti, a key figure in the revolution, lived here in the 1890’s as he worked on planning and raising funds for it. The Scarfone Gallery hosted an exhibition of contemporary Cuban art at a few weeks ago. Lopez and Rey were able to take students to Cuba beginning in 2009 when the Obama administration lifted the restrictions on travel. 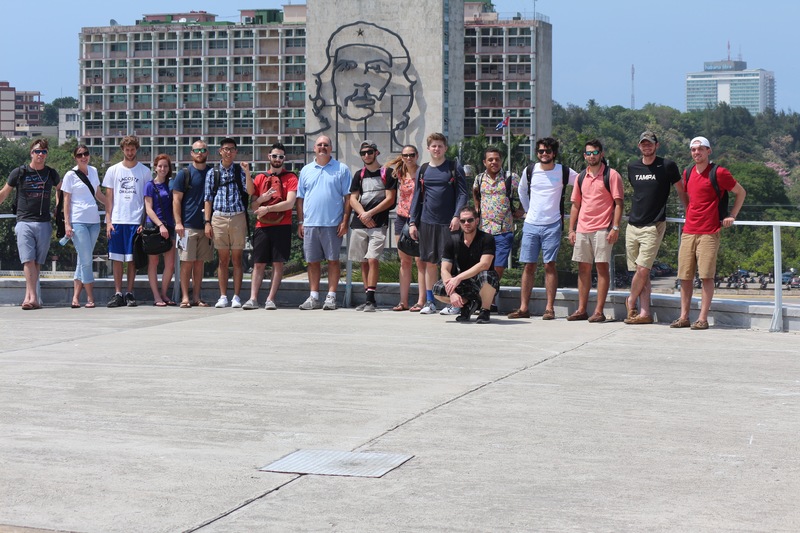 The students in the Cuba travel course studied at the Centro de Estudios Martianos (Center of Martí Studies) in Havana and learned about the history of the United States’ relations with Cuba, and the writings of José Martí, a key figure in the Cuban struggle for independence. Charles Martinez, a senior government and world affairs major who took the travel course in May 2014, was surprised how friendly and open the people of Cuba were. As far as the future for UT and Cuba’s relationship, the university has a lot in the works and hopes to have even more of a closer tie. The university hopes to continue to create opportunities for students and professors to study or be involved with research in Cuba. Another travel course, Cuba and the U.S.: Then and Now, is being offered during May term. Martinez recommends that everyone visit Cuba.